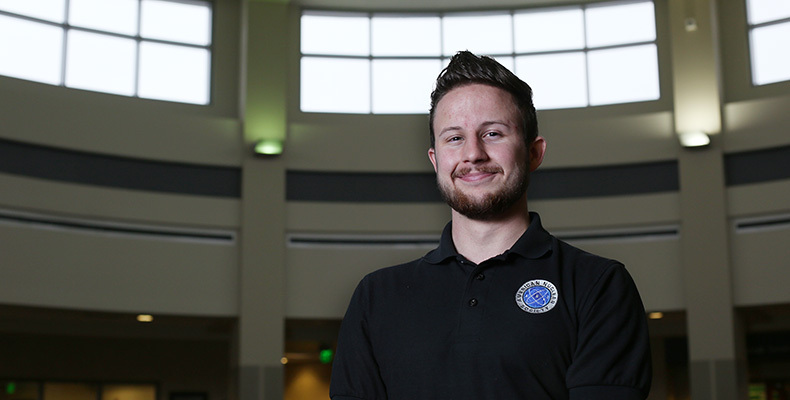 Dylan Prévost, a senior in nuclear engineering from Wickenburg, Arizona, learned who he really is by overcoming adversity. His decision to attend Missouri S&T was a huge leap of faith in himself and his family. Prévost’s father was diagnosed with amyotrophic lateral sclerosis, also known as Lou Gehrig’s disease, almost 11 years ago. His father was unable to continue working due to the illness, while Prévost’s mother stayed at home to help care for him. As the family downsized, the possibility of a college education became more and more uncertain. Prévost applied for dozens of scholarships hoping to study nuclear engineering. Once he chose Missouri S&T, he moved to Missouri to qualify for in-state tuition. Last fall, Prévost was awarded the Pursuit of Life Scholarship from Team Orion, a group of three young alumni who founded the scholarship with funds left over from their senior design class. The alumni, each of whom overcame immense adversity to get to S&T and graduate, agreed that the best use of the leftover money would be to give it to a student in need. Team Orion awarded two scholarships to students who demonstrated perseverance and ambition, and overcame adversity in their lives. In addition to his coursework, Prévost has worked various jobs on campus since starting at Missouri S&T in 2011. As a research assistant for Ayodeji Alajo, assistant professor of nuclear engineering, Prévost currently works to design a liquid thorium-fueled modular nuclear reactor that would be safer than existing reactor technology. He hopes to continue his education through graduate school to study computer-computational transport and how to improve the design of nuclear reactors. In addition to his research, Prévost is a counselor at Missouri S&T’s Nuclear Engineering Summer Camp. He has been president of the American Nuclear Society student chapter at S&T for two years and is a member of the Phi Sigma Pi honor fraternity. “My family has been through some struggles, but nothing is stronger than family and I have had great support from them,” says Prévost. Read more about Team Orion and the Pursuit of Life Scholarship in the latest issue of Missouri S&T Magazine.